Employers that fill their retirement plans with active fund managers encourage the kind of bad investor choices that lead to underperformance. Over the years, I have been critical of the way 401(k)s are created, administered and managed. They can be expensive and filled with underperforming actively managed funds, some of which charge way too much. Some retirement plans offer too little diversification, especially in international and emerging-market sectors. I have also noted that you, the individual investor, are a very large part of the problem. The good news is that Morningstar has a solid lineup of options in its selection of 23 funds. Many of these have outperformed their benchmarks over five and 10 years. The bad news is that the list is long and it can be confusing; a few of the funds are on the pricey side. The worst aspect is the limited number of index funds. What is my beef with active funds? Experience teaches us that investors — and especially retail investors — tend to chase hot funds. A manager shows up on a magazine cover or on television AFTER a period of outperformance. He talks a great game and looks and sounds smart. The problem is this invariably occurs just before mean reversion rears its ugly head. All that earlier overperformance is offset by subsequent underperformance. The kind of behavioral issues I write about so often are an embedded feature in most 401(k) plans. Companies that fill their retirement-saving plans with active fund managers, whose returns wax and wane with the market, encourage the kind of bad investor choices that lead to underperformance. And not only do too many plans offer a lot of expensive funds, we also know that many people will pile into — and out of — them at the worst possible moments. 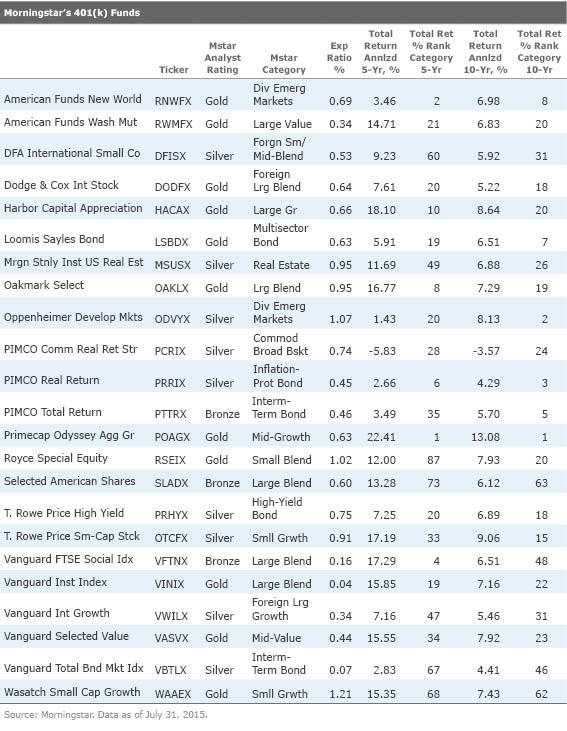 It is worth noting that many of the most expensive and active funds in the Morningstar lineup have inexpensive index alternatives. For example, the Morgan Stanley Institutional U.S. Real Estate has an expense ratio of 95 basis points and could be replaced with a real-estate investment trust index such as the iShares Global REIT ETF, with an expense ratio of about 14 bps. Same for the Oppenheimer Developing Markets fund, at 107 basis points. The Wasatch Small Cap Growth is the most expensive in the Morningstar lineup at 121 basis points; Dimensional Funds offers a variety of small-capitalization growth funds that charge less than a third of that. The reason fees matter so much is because you don’t know in advance which fund in your 401(k) will be the outperformer. However, you can control how much of a drag costs will be. This is especially important when you consider the effect of compounding over years or decades. In my view, the ideal 401(k) looks like, well, my own 401(k). It is filled with inexpensive index alternatives for each major asset class, primarily using Vanguard and Dimensional Funds. Where I deviate from that is when some aspect of active management has proven to be helpful. I use a yen-hedged Japan fund from Wisdom Tree and an active bond fund from Doubleline. You can put together a solid lineup from the Morningstar list: Use the Vanguard and Dimensional Fund funds and you have the basics of equity and fixed-income covered. It isn’t perfect, but it’s pretty good. And it is least likely to suffer from the sorts of bad behavior that damage long-term returns for savers in so many retirement plans.